If you have ever awakened with a back ache or neck pain, or if you toss and turn all night, not able to fall asleep or stay asleep, you know how miserable it can make you feel. Starting off with a migraine, a headache or a stiff back does not make for a good day going forward. Sleeping with your spine in the wrong position while you sleep can lead to a number of health problems and definitely affect your mood for the day. Often times, your pillow could be placing you in the wrong position and it not only is keeping your from getting a good night’s rest, but it could be causing other health issues too. Good support and posture while sleeping or awake are important for our spines and our overall general condition. When weight is placed on the neck, spine, or lumbar, our whole body structure is stressed. When we stand, sit or lie down, gravity exerts a force on our joints, ligaments and muscles. It is unavoidable unless you live on the moon. When the weight is not evenly distributed between our neck, lumbar and spine, our body is out of alignment and basically becomes stressed. How can a pillow even out that weight and ease the stress? There are several ways to do provide your body with the foundation it needs with proper use of support pillows . First in the sitting position, such as when we sit at our desk, people tend to lean forward making this one of the more troubling positions that can cause backaches and headaches. By placing a small pillow in the arch of your lower back, the ideal position for the spine, the S-shaped curving, is returned. A lumbar support cushion is ideal as it fills the gap between the lower spine and the chair creating a more natural position. As the lumbar support cushion supports your lower back, it is making you sit up straighter and that in turn will have you holding your head up straight by supporting the neck. Traveling can be hard on the spine and neck as well. 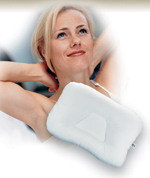 There are special travel support pillows that are designed in a U-shape and fit around the neck. By supporting the head, the travel support pillow eases the stress on the neck muscles, a definite must have for those who may sleep while traveling. Another great support pillow to have during travel is the donut pillow. This is perfect for those who suffer from coccyx pain because it takes pressure off that region. Expectant mothers can most certainly benefit from these support pillows as it helps absorb gravitational forces. It is important to find a support pillow that supports your back while in the lying position and that has the right firmness to support your neck too. Don't hesitate to try different types of neck support pillows. Just by looking at the size of the neck roll pillow you can tell if it’s too small or too large. The pillow should align your neck to the rest of your body. Neck roll pillows make great support for your hips, ankles, and at the back of your knees too. By sleeping with a contoured pillow that fills the spaces under your head and neck, you can get the maximum support that will lead to a restful sleep. Memory foam pillows are excellent neck support and retain their shape pretty well. Buckwheat pillows are filled with dried buckwheat husks that provide excellent air circulation. For those that sleep on their sides, a pillow placed between the knees will help to ease the strain on your lower back. A body pillow will give you overall body support. By learning which support pillow is best for you, you can get rid of most aches and pains forever. 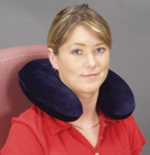 The wrong types of neck pillows can be the cause of a sore neck, back pain, snoring, numbness of arms and hands. There are different types of support pillows today and with a little research, finding the right one is possible. This article was published on Sunday 15 January, 2012.